Fields, roadsides, railroads, clearings, fencerows; savanna (with jack pine, aspen, oak), especially in sandy or rocky openings; prairies, fens, sedge meadows, shores; gravel and borrow pits, other disturbed sites. This is a complex species consisting, according to some authors, of as many as 4 or 5 intergrading varieties. 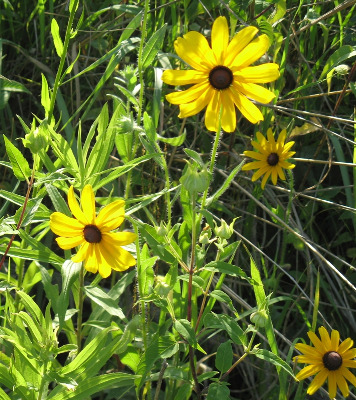 It is also cultivated, especially as large tetraploid cultivars “Gloriosa Daisy.” Most of our plants are the rather weedy var. pulcherrima Farw. A few are apparently var. hirta, with broader, elliptic-ovate lower leaves, an eastern variety characteristic of undisturbed habitats. The size and color of the rays (and also the disk), the shape and toothing and size of the leaves, and the amount of pubescence on the receptacular chaff are all quite variable. The rays are rarely bicolored, more numerous than usual (heads “double”), or lacking, mostly in escapes of cultivars. MICHIGAN FLORA ONLINE. A. A. Reznicek, E. G. Voss, & B. S. Walters. February 2011. University of Michigan. Web. 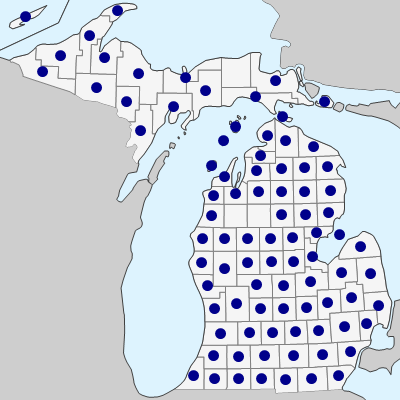 April 24, 2019. https://michiganflora.net/species.aspx?id=436.